Vegetables, Sabzis, Dals to Lower your Cholesterol. low cholesterol vegetables, low cholesterol Indian sabzis, low cholesterol dals. Subzis and Dals bring to our mind a yummy dish floating with ghee, butter or cream. Pick low glycemic index foods as they will not shoot your blood sugar level and enable fat burning. But free yourself from the calorie and Cholesterol scare with innovative recipes from this section. Brinjal, Carrot, Fenugreek, French beans, Greens - you name it and you will find an interesting subzi made with any of these vegetable here. Green peas are good for weight loss, good source of vegetarian protein, has insoluble fibre to relieve constipation.Legumes like green peas, cow peas, mung, chick peas and kidney beans have a cholesterol lowering effect. Enjoy this super green peas ambti recipe which is a popular Maharashtrain sabzi. Another super healthy fibre rich option is green peas in peanut curry. Raw Onions lower bad cholesterol (LDL) keeping your heart healthy. The chromium in onions help regulate your blood pressure. So enjoy our turai onion vegetable recipe which uses 1 cup of onions. A prefect side dish to your sabzis is sliced onions with lemon juice and green chillies and this must be on the lunch and dinner table with anyone with cholesterol issues. Toor dal is rich in proteins, the building block of good health. High in fiber, diabetic and heart friendly. Being an excellent source of folic acid, pregnant women must include toor dal in their daily diet. Try Toovar Dal and toovar dal with onions recipe which has heart friendly onions in it. A variety of dals have been used to put delicacies like Dal Moghlai , Dahiwali , Khatti Meethi Dal , Khatta Urad Dal etc. And when you have some greens in the refrigerator do use them to whip up dals like Hariyali Dal, Suva Masoor Dal and Palak Toovar Dal. Rich in taste and nutrition, these recipes are a healthful dish you can prepare frequently without much hassle, as they make use of simple cooking methods and common ingredients. 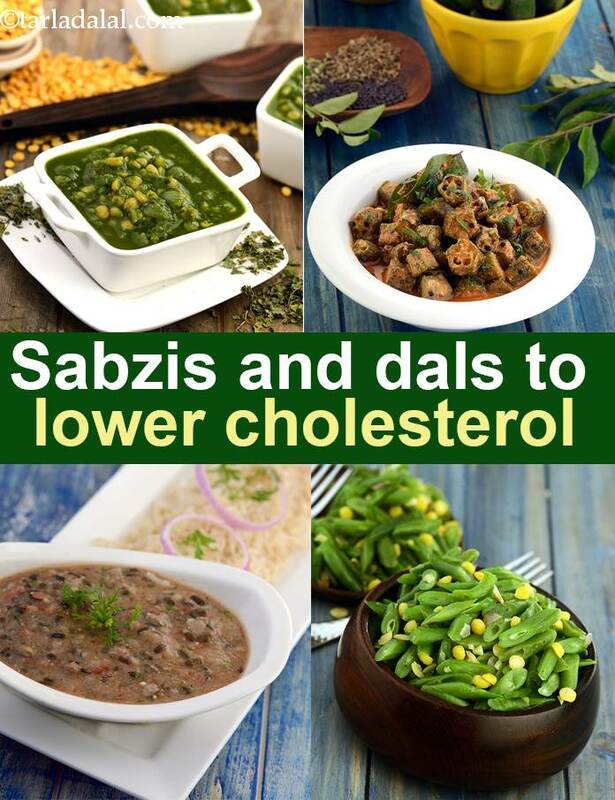 Enjoy our low cholesterol vegetables, low cholesterol Indian sabzis, low cholesterol dals and other low cholesterol articles below.